For the past two days, M, J1, and J2 have been using the snap cubes as part of their dramatic play and have arranged them in very interesting ways. 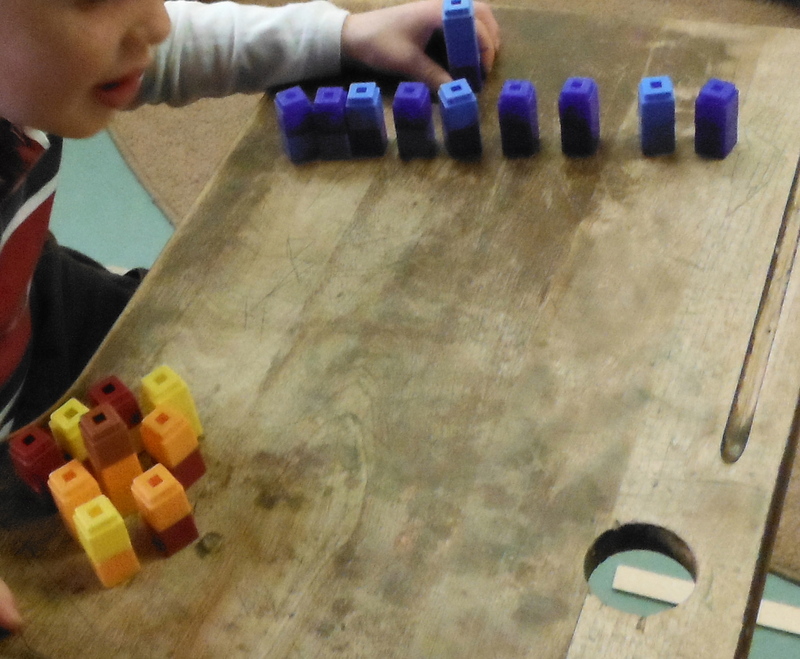 I first noticed M and J1 at the two wooden desks, facing each other and carefully grouping their cubes according to colour. I was drawn to them because I could hear J1 singing. J1: They’re singing their national anthem. J1: Grab your kids and grab your snacks ‘cause this one’s going to be a doozy. 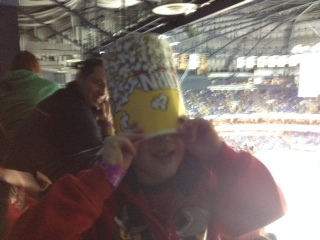 J1 had recently been to a professional hockey game with his family and had shared his experience with the class. J1: This is my best guy. M: These are the bad guys, these are the good guys. 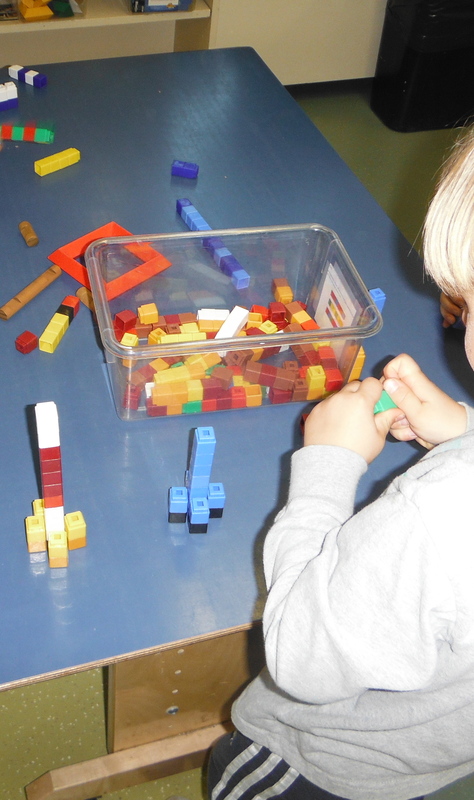 The next day, when J2 returned to school, the play continued with him, this time at the table in the math centre. Later that same day, M and J revisited their play at the wooden desks again. Question: What are the big towers for? What’s the difference between the big towers and the little ones? J1: Mine are karate fighters – ‘cause I play karate. M: And mine are martial arts, ‘cause I play martial arts. Mme: Tell me about the patterns. M: We use them as their fighter suits. Mme: Have you noticed that people have patterns on their clothes? J1: Like me – I have green, blue, green. Mme: And like on my shirt. How does this play fit into our curriculum expectations? Now let me say a little about how I assess and how I see assessment in the context of the Full-Day Early Learning Kindergarten program. I believe that all assessment is based on noticing and valuing. As soon as you notice something, you’ve ascribed value to it (positively or negatively) and have therefore assessed it – to varying depths. For instance, when I notice two students wrestling on the carpet, I assess that negatively because, in the school context, I don’t value it. It’s often not a particularly deep assessment although it has prompted me to think deeply about the role of physical play in children’s development. It’s usually a superficial assessment that the play is getting dangerous and so I intervene. However, the process of noticing and valuing can be much deeper. In the context of a play-based classroom, I see one of my roles as being that of a detective. 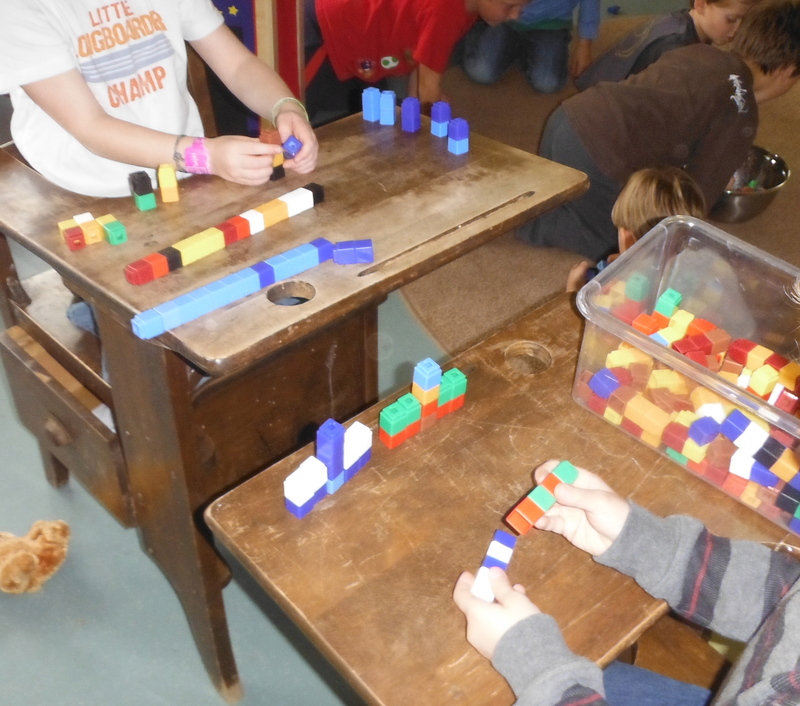 I am looking for places where what the children are doing intersects with the curriculum. I see the curriculum as being, in large part, a description of a developmental stage, rather than a list of things I need to teach in a top-down way. I believe that, given exposure to the right materials, environments, and experiences, children will learn these things and will demonstrate their learning in their play, their conversations, their artwork, and their writing. If there are areas where we’re not seeing that learning, that’s where we may need to do some more direct instruction, either one-on-one, in small groups, or with the whole class. We may also need to modify the environment and change the materials. I’ve written before on this blog about the inherent subjectivity of this process. All assessment is subjective. We, the grown-ups, decide what to assess, when, and how. The curriculum itself is subjective and culturally-specific. I point this out not to devalue our curriculum but to put it in context. It is a living, breathing, document. It gets revised regularly and what we choose to value within children’s learning changes. Where subjectivity becomes dangerous is when we don’t pay attention to it – when we trick ourselves into thinking that we have magic, objective powers. We need to always be aware of our subjectivity and to critically examine it. Are we missing something? What are the children doing that we don’t notice? What are our biases? Having two people in the classroom has made a huge difference for me this year. The Early Childhood Educator that I work with notices different aspects of the children’s play than I do and I am so grateful for that diversity. It keeps us both honest and highlights our own subjectivity – awareness is key.